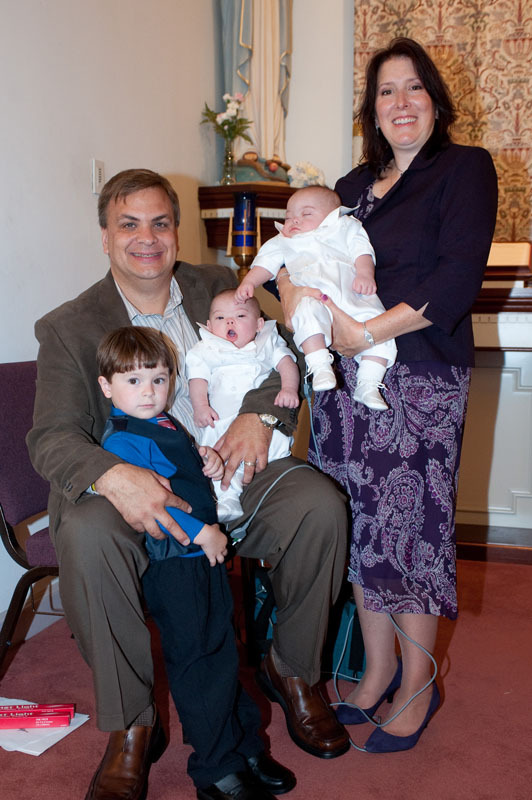 BOB FORD/TIMES NEWS PHOTOS Eric Waksmunski, and his wife, Mary Anne Christo, pose for a family portrait at the twins’ baptism in South River, N.J. last September, with sons Jesse, standing, Shane and Wyatt. The couple, who live in Mahoning Township, returned to their hometown for the twins’ christening. It’s been almost a year and a half since Mary Anne Christo and her husband, Eric Waksmunski, became the parents of twin boys. Prepared for an early birth, as serious prenatal issues required the babies be delivered 10 weeks premature, the couple was not prepared when both boys were diagnosed shortly after birth with Down syndrome. The Mahoning Township couple has experienced some scary, stressful days as their boys spent the first few months of their lives in the hospital. Shane and Wyatt have each been through multiple surgeries and frequent hospitalizations. But there have also been good days — baptisms, birthdays, holidays and other celebrations, both big and small. Throughout these days — the good ones and the bad ones — the one thing the Waksmunskis have always been able to count on is each other. In Chapter Four, read about how this couple has supported one another through the roughest period of their lives, and learn how important it is for couples who are raising a child with special needs to take time for themselves and work toward preserving their relationship. When Mary Anne Christo first met Eric Waksmunski she really fell for him — hard. The two met while rehearsing for a performance of “The Best Little Whorehouse in Texas.” In a scene from the play, Waksmunski was supposed to catch Christo as she fell backward, but instead, he dropped her and gave her a concussion and a trip to the hospital. “I’ve had a headache ever since,” says Christo jokingly. That wasn’t all Waksmunski gave Christo. Fifteen years later, he gave her a ring, followed by a marriage and three sons. Mary Anne Christo and Eric Waksmunski try to help son Shane get adjusted after he arrives home from the hospital in July of 2010. Shane had originally come home when he was 11 weeks old, but after a little more than a week, he was rushed to Janet Weis Children’s Hospital in Danville. Within a few days, brother Wyatt was flown by helicopter from St. Luke’s Hospital, Bethlehem, where they were born, to join him. It would be several more weeks and several more surgeries before the boys would finally get to go home. Jesse, now 4, was born in July of 2007. Shane and Wyatt arrived a year ago in March. Ten weeks early, the twins were diagnosed with Down syndrome soon after they were born. Through a rough pregnancy, a devastating diagnosis, and some very scary days when they didn’t know if either or both of the boys were going to survive, Christo and Waksmunski have counted on one very special thing to get them through — each other. They are pretty sure their relationship will go the distance. The general assumption appears to be that marriages often fall apart after the birth of a child with a disability. This would appear to be a very real possibility, given the additional pressures couples face when raising a child with special needs. Waksmunski recalls reading somewhere that almost three out of every four couples who have a child with special needs ends up in divorce, with the mother typically being the one to bear the burden of raising the child alone. “We are very fortunate,” says Christo, recalling that the nurses who would come to the house to help out with the twins after they were born often told them to make sure the two of them stayed together, not to fight over it, and to make sure they had time together. “I think that’s what happens to a lot of couples,” says Christo. “They just can’t deal with the stress and kind of take it out on each other, but we always say we’re so fortunate. Eric’s the type, he just doesn’t sweat the small stuff. He just lets things roll off his back. While the Waksmunskis appear to have a strong marriage and a supportive relationship, it seems the statistics may also be on their side. According to a study by researchers at Vanderbilt University’s Kennedy Center, divorce rates are slightly lower for couples raising a child with Down syndrome than in the comparison groups. 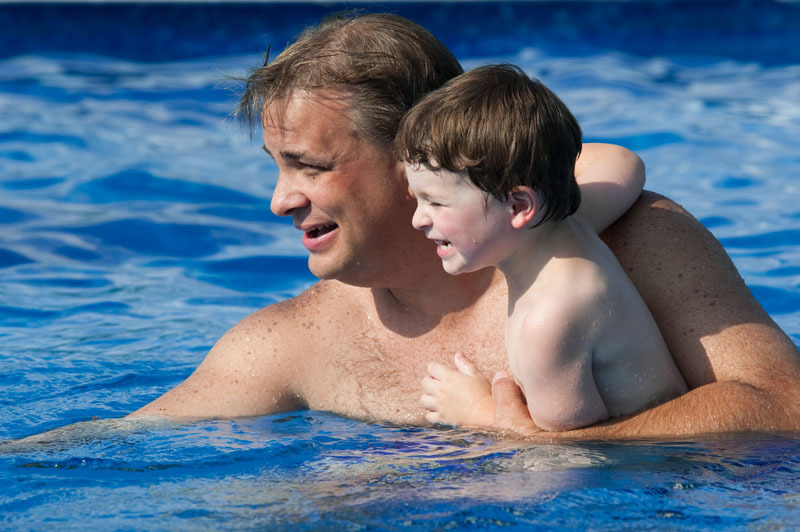 Eric Waksmunski and son Jesse enjoy a swim in the family’s backyard pool. Dr. Laura Marshak, a licensed psychologist, professor of counseling at Indiana University of Pennsylvania, and the author of several books, including “Married With Special Needs Children,” which she co-authored with Fran Pollock Prezant, says that while divorce is a possibility for some couples raising a child with special needs, that seems to be more problematic for some types of disabilities, such as autism spectrum disorders. “Down syndrome has appeared to be an exception,” says Dr. Marshak, “and yes, there has been research that suggests these marriages are more stable than many. While writing our book, my co-author and I learned about the marriages of hundreds of couples who had one or more children with disabilities. “Our firm conclusion was that for any particular couple, the impact had more to do with whether or not they decided to ‘protect’ their relationship despite the onslaught of new stressors and intensified demands on their time,” she adds. Dr. Marshak says it is important for couples in this situation to not feel guilty for taking time for the marriage, no matter how busy they are. “Some parents make the mistake of feeling any time taken for self care or for care of their relationship, takes away from the children. The reverse is true. Protecting a marriage is good for parents and children,” she says. 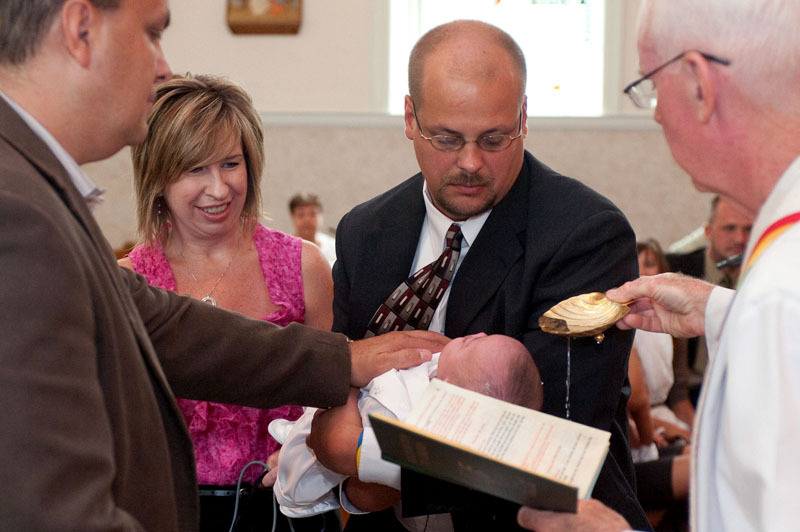 Eric Waksmunski, far left, with his sister-in-law Gail and brother Brian, as son Wyatt is baptized at Corpus Christi Parish in South River, N.J.
Dr. Marshak shares her favorite example of protecting a marriage. It comes from the mother of five children, including one with Down syndrome and one with autism. She and her husband had been married for over 20 years. “I think this is a great example because it also demonstrates several of the strategies that help keep a marriage strong under such circumstances,” says Dr. Marshak. “These include allowing herself the time to continue a hobby or interest, prioritizing time for a bit of romance, creativity in working around obstacles and not allowing disability issues to pervade all activities. While most marriages would be put to the test after receiving the news that they had delivered not one, but two babies with a disability, the Waksmunskis were able to build on their strengths. They both took the news very hard, but while both needed time to grieve, Waksmunski went into action immediately. By the evening of the twins’ birth, he sat by Christo’s bedside on his laptop, crying, but researching Down syndrome. While the couple expressed their grief and sadness in different ways, they communicated and shared their feelings with each other. 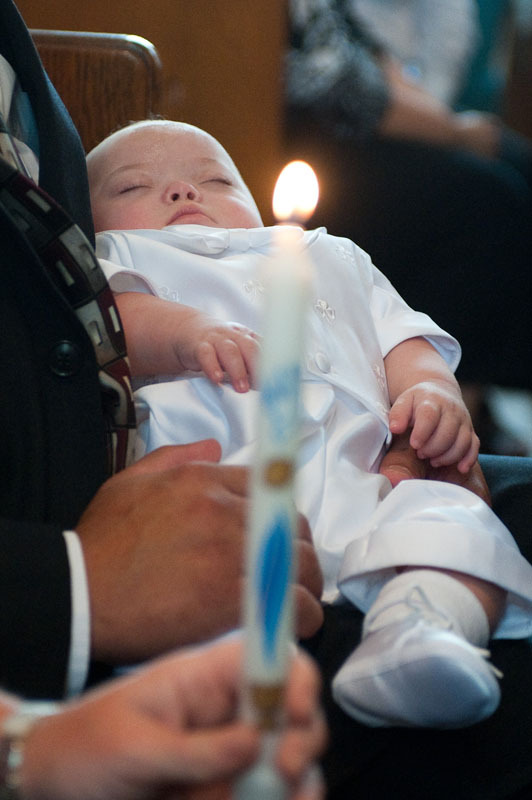 Wyatt Waksmunski rests in his Uncle Brian’s arms as he and brother Shane are baptized. While she knows there was nothing she could have done to cause her boys to have Down syndrome, as it is purely a matter of genetics, Christo still second-guessed herself, and worried that she had been working too hard gardening around the time that she got pregnant. Dr. Marshak says it is common for parents to experience a range and mixture of emotions following a diagnosis that their child has a disability, including intense grief, strong anger or disbelief, as well as guilt, as in Christo’s case. “It is so important to understand that initial feelings don’t predict how much a parent will love his or her child or be able to adjust to the challenges that follow,” says Dr. Marshak. “I have known some parents who were initially so immersed in emotional pain that they did not want to live. Over time, they loved and enjoyed their children deeply and became dedicated advocates. 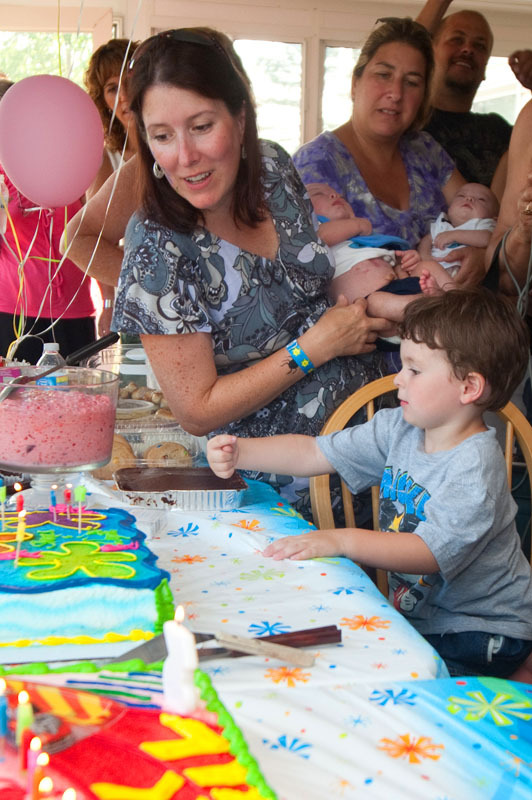 Mary Anne Christo, far left, prepares to help son Jesse blow out the candles on his birthday cake on July 24, 2010. Jesse’s third birthday party also served as a welcome home party for Shane and Wyatt, who were released from the hospital just three weeks earlier. After months spent in the hospital, the Waksmunski family was glad to have their whole family home and to celebrate with loved ones. Couples facing the challenges of raising a child with a disability can help each other and themselves better manage their situation. Dr. Marshak says that first, they should accept their own feelings and the right (and likelihood) that their partner may have different emotional reactions. As an example, Dr. Marshak cites parents who grieve openly and who may negatively judge their partner for not displaying such emotion. “On the other hand, partners who adopt a stoic or angry approach may see their grieving partner as weak,” she adds. • Prioritizing and protecting even a little time for self-care. “Parents need to remember that most people can adjust to life circumstances that they think will be too much to bear,” adds Dr. Marshak.